There are a lot of different kinds of cookware out there but a couple more of the most popular and noteworthy copper options are both Copper Chef and the second being Red Copper made by Bulbhead. Copper Chef promote their pots and pans as ones that work in many situations. Including working on all stove types such as electric, gas, ceramic etc and oven cooking. Also, they can be used for all kinds of cooking such as frying, steaming baking and basically anything you can imagine. The couple of main selling points of their cookware is undoubtedly the copper they are using for the base of each of their pots. They feel strong and sturdy and built to last a lifetime. It’s also worth mentioning that they are not heavy, though they aren’t super lightweight either, I do feel they have got a nice balance between build and strength and not being to heavy, a nice medium if you will. As far cooking with them goes – in my usage they were very pleasurable to use, this was because they are coated with a non-stick. In my usage for over a month I never had any issues with sticking and stuff getting burnt because of it unlike some cheaper pans I have used in the past. In my own cooking I was primarily frying/sautéing and steaming. I tried many different kinds of oils and even cooked some meats/eggs without oil at all and still it didn’t stick. Of course, as it doesn’t stick it means cleaning them is a breeze. Just a little soap and hot water and they are good as new in seconds. I rarely needed any scrubbing or being forceful to get them clean. As for them marking or becoming damaged over time well I didn’t notice any problems whatsoever. Even when I am using metal utensils when I am cooking it didn’t mark or damage the bottom on the pan so for long term usage I think these will be a great long-lasting solution. The induction plate of the pots and pans is made from stainless steel this makes the heat induction and distribution more even and fast. Also, the handles are made from stainless steel which makes them easier to hold as they don’t hold the heat when cooking on the stove as they aren’t part of the main copper base which is a nice design choice. The first thing you will notice with the Red Copper pans is there design choice. They are made from copper mostly but have a stainless steel riveted handle and red paint outer design. The way the base material of copper is separated by the stainless-steel handle allows the handle to remain much cooler than the base and much easier to hold even when the stove is up high. As for the cleaning these clean really easily all you need is a little warm water and soap and in most cases, you don’t even need a scrub brush which is great. Design – I personally prefer the design of the Copper Chef, it looks better and more modern than the red copper counterpart which to me looks a bit dated. Also, the red copper red paint does tend to start to chip based on long term usage on other reviews I have read. Both options have handles that have rivets and are easy to hold because of the design and separate materials they have used from the base. Cooking – Both options work great for all kinds of cooking and both can be used in the oven as well. In terms of which is better for preventing sticking I would definitely say the copper Chef has a noticeable edge in that area though other than that they are quite closely matched – the heat up quickly and have an even distribution of heat. Cleaning – Both of the options clean really easily and in both cases, you don’t even need a scrubber to remove the dirt and grim. Again, because the Copper Chef doesn’t stick as much cleaning it is generally a little easier. Non-stick material – Both pans have a nonstick material on them. Though the Copper Chef ones seem to me to be quite a bit more tough and durable. The coating almost seems thicker and tougher than the Red Copper counterpart. 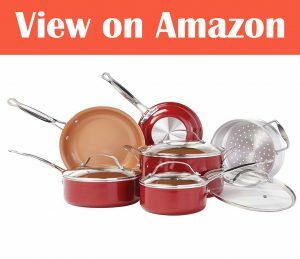 Though I myself have not encountered scratching with the Red copper cookware there have been quite a few reviews that have mentioned it chipping on the cooking area of the pans. Finally it’s worth noting both pans use a non-stick coating that is PFOA and PTFE free. Weight – The Copper Chef cookware is a little heavier than the Red Copper counterparts. 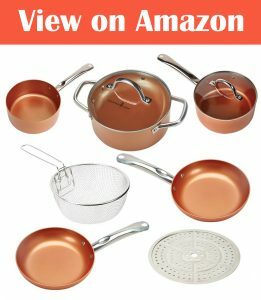 I would consider the Red Copper to be quite lightweight and if you are looking for pans that are lighter the Red copper may be your best bet though the Copper Chef has a nice weight that isn’t to heavy or to light – it’s a nice medium. Price – The price comparison between the 2 is relatively comparable with the Red Copper cookware being slightly cheaper than the copper Chef cookware at this time of writing. Overall both sets of cookware are both good options, but I personally would recommend Copper Chef over Red Copper. This is primarily because Copper Chef is built stronger and more durable than the Red Copper and will be a better purchase in the long run thanks to its construction and overall build quality.